Make use of your student card! As a student in Sweden, you are in many cases offered special discounts. With the student card, you can get online and in store discounts for example, IT and telecom, food, tarveling, clothing, makeup & skincare. 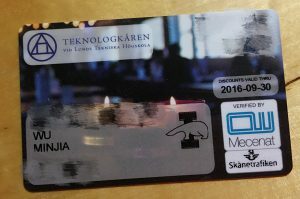 Many stores in Lund and other cities in Sweden have their special students discounts and don’t forget to show your card. If you want to join clubs or enjoy good price lunches in the nations, the student card is used as an ID to enter clubs and restaurants. You may ask how can I get my student card. That’s really easy, as a student at Lund University you will automatically receive your student card when you join a nation or union. So from now on, explore your student’s benefits using your student card! The picture is my student card issued by LTH Union. This entry was posted in Student life and tagged Lund University, Student life. Bookmark the permalink.